Are you ready for a website that you can be proud of? How about a website that not only looks professional but actually WORKS for you? Is it high time for you to get your business out there? Or are you tired of messing around with a less-than-awesome website that doesn’t fully represent your awesomeness? First impressions…yeah, you don’t get a do-over on those. If your online presence is anything less than professional, attractive and functional, peeps are gonna move right along to your competition. You don’t want that! You want an online hub for your business that connects instantly with your beloved ideal clients and gets them moving in the right direction ASAP – toward hiring/buying from YOU! I want to look like the professional that I am! I am ready to uplevel my business and seriously achieve my dreams. I don’t want to waste any more time or money on this crucial part of my business. I know my strengths and I value my time. I’m ready to delegate this task! At BlissVille Design, we’re here to make you SHINE. Hey, that rhymes! Seriously though. We’re the professionals that are gonna make you look professional. Leave it to us, so you can get out there and do what you do best. We’ve designed our options to include features that we feel our clients need to succeed online, and the features that most of our clients ask for, with a price range that fits most budgets. However, you are unique. Don’t see a feature or functionality that you need or want? No problem. Contact us and we’ll put together a package that perfectly suites you. Our super sweet, all-inclusive website design package. 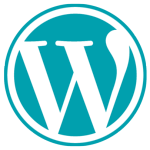 Having a professional, custom designed website has never been easier! On a tight budget but still want to look professional? Get a stunning website that works hard, while saving your bottom line. We know that you want to get growing NOW. 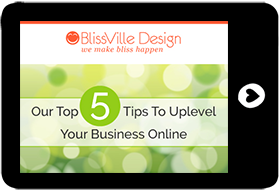 So join our list and get Our Top 5 Tips to Uplevel Your Business Online! Check your inbox for your confirmation email!